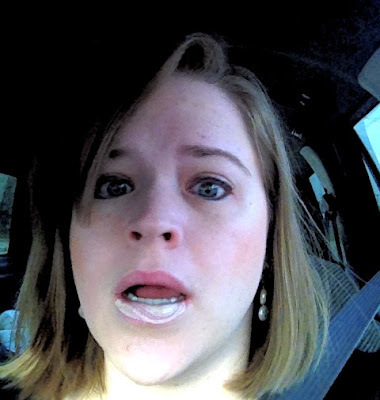 Little Mrs. Married: And by crazy, I mean traumatic. Last week was a traumatic week for me. In some ways, I'm being a little dramatic. In other ways? NOT REALLY! I would like to tell you about that time i almost pee'd on myself. At 34 years old. There was quite a significant day last week, as far as traffic is concerned. 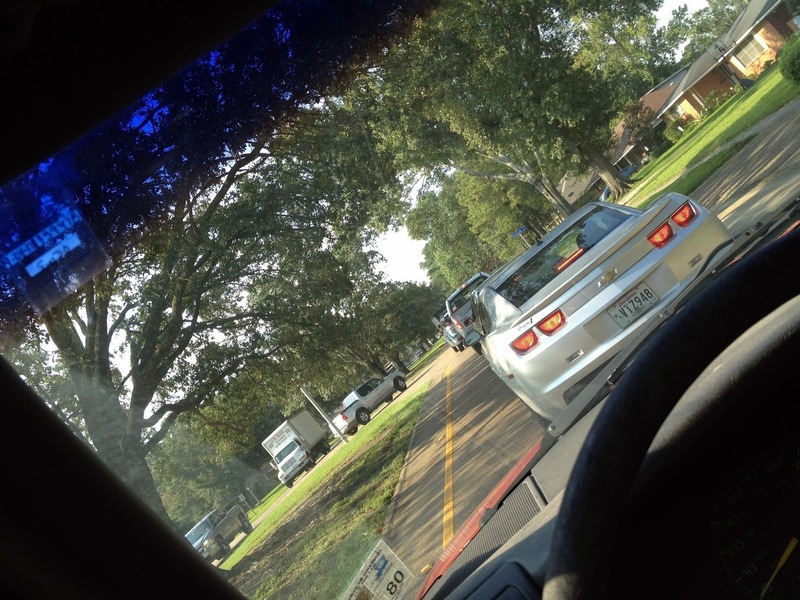 And if you didn't already know, Baton Rouge has TERRIBLE traffic just about every day. It's just how it is. But on last Wednesday, the word "traffic" took on a WHOLE NEW MEANING for me! "If you're trying to get to Essen Lane this morning, good luck getting there!" Hmm. 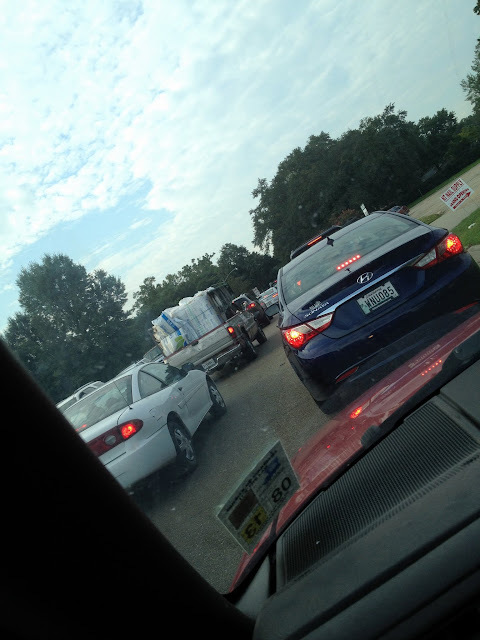 I scrolled down a little & then saw a post from WAFB about an accident on the interstate near Essen. Brad works on Essen Lane. So i ran to tell him that he better hurry & leave early because there was an accident. Then i got myself ready! 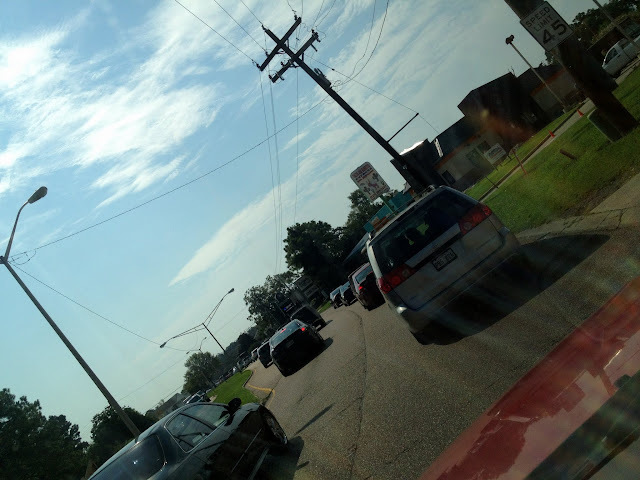 I do not work on Essen, but i do travel that way, so i decided to avoid the interstate & go a back way. Good thinking, right? Brad stayed home. He's like, "I'm not getting out in that! I'll be sitting two hours! Might as well stay home & go in later!" I'll be honest, I was kind of annoyed. Miss work due to TRAFFIC?! Who does that?! Plus, he'd been out sick two days already. I was jealous - i wanted a day off too! But i can't really afford to miss work or i'll never get caught up on my responsibilities there! So i left the house at 7:30. I was going the back way. At 8:00, I turned from Florida Boulevard to Sherwood Forest Boulevard. My office is 2.1 miles away at this point (I looked it up!). That was at 8. I arrived at work after 10!!!! Ya'll. The reason i say TRAUMATIC, is that ... at some point, I had to pee. Please stop reading now if this is TMI. SURELY NOT, though, right? ANYWAY. It started out kind of amusing that i had to pee when i was stuck in traffic. At this point, I didn't realize HOW LONG i would be there. Brad usually fixes coffee soon after i wake up. By the time i leave, i have had coffee & also emptied my bladder. But this particular morning, he made it right before i left, so i had just enough time to pour it into a travel mug - which means it was twice as much as usual - and take it on the go. I had NO IDEA i would be stuck in 2.5 hour traffic! I thought i would be avoiding it by avoiding the interstate! SO i drank the coffee, made it to Sherwood & thought i was home free. My office is 2 miles down. yes, i took pics. um... we weren't MOVING! At 8, i texted the assistant director. He was stuck in it, too. Then i texted my boss. She lives two minutes from work & she was also stuck. 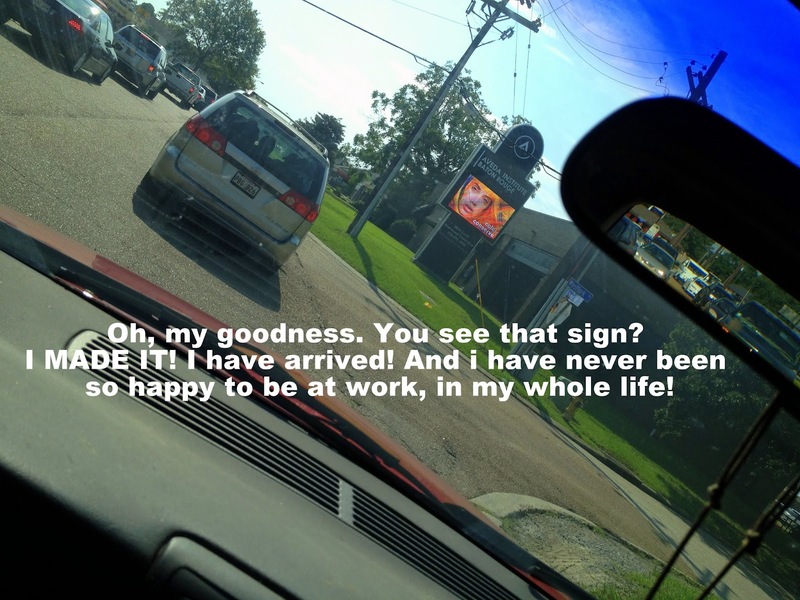 The humor in the fact that i had all that coffee & was now sitting in traffic - well, it eventually turned to discomfort. Then it turned into URGENCY. And then? Well. It was bad. I cried. I actually CRIED because i was pretty sure i was going to PEE IN THE CAR! Yes, I'm a grown woman. Have you ever had to pee that bad? I don't think i have. I tweeted "This having to pee has gone from funny to uncomfortable to URGENT!" And then later (because the area of Sherwood I was on is lined with houses): "I am looking at all these houses & all i can think is: They all have bathrooms." 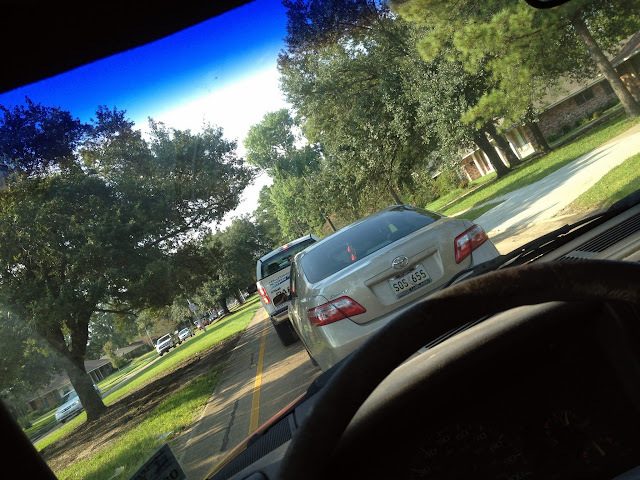 #batonrougetraffic #desperate"
Y'all. When i say it was HORRIBLE, TRAUMATIC, INSANE! I mean it! I called Brad, in tears. He is like "What is wrong?!" Me: I am crying because i have to GO TO THE BATHROOM SO BAD!!!! Brad: Oh my god! I'm so sorry, baby! Can't you pull over & walk to McDonalds or somewhere? I just kept talking to him as i sat through my third light cycle on Sherwood at Goodwood. I just couldn't get close enough to turn. I FINALLY did, turned on Goodwood & prayed for a school or church or SOMETHING! (it's a neighborhood with places like that. No restaurants or anything). I saw St. Thomas Moore Church & pulled in. I saw the preschool drop-off around the side, pulled up next to it, hastily wiped my tears & ran inside. There were two very kind ladies who i owe flowers or chocolates or SOMETHING - and i said, 'Please do not laugh at me, i have been in traffic for over two hours & i have to go to the bathroom REALLY BAD!" LOL!!!! Someone said i gave them the courage to do that if they had to pee on the road, but y'all. I was not being courageous. Don't you understand? I had NO CHOICE in the matter! It was either a little embarrassment & a relieved bladder in a toilet! Or PEEING ON MYSELF!!!!! And i haven't done that since i was... two????? I mean, seriously. That was just not going to be okay with me! The ladies smiled & pointed me in the direction of the bathroom. I did my business, came out & thanked them again! I said, I am so sorry! I know i'm crazy! I left my house at 7:30 (at this point it was after 9:30) & i drank a big thing of coffee not realizing!" 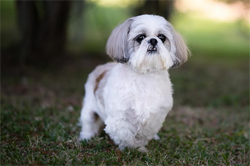 & she's like, "oh i know, the traffic is all over the news b/c of the interstate being shut down!" I mean. GAH! The more i sat in my car, the more i thought brad was pretty smart for staying home! He never would have made it! After i left the St Thomas Moore feeling MUCH BETTER, i went a WAY OUT OF MY WAY way to get to work - because i was NOT getting back in that traffic! I honestly think if i had stayed, i wouldn't have made it to work until noon. Seriously. I would have DIED! Oh, but miracle of miracles. Aveda was finally within my vision. Can you see it? No? Well, I'm almost there! HA! Yeah. It took me 2 hours to go 2 miles. And by the way - there was no way to get out of it. I was STUCK. NO turn off anywhere in the spot i was! How lovely! So we found out later that a car flipped & an 18-wheeler slammed on his brakes to avoid hitting the car. This caused another 18-wheeler to slam into the first one. It caused a isobutane leak & the interstate had to be shut down for 27 hours until it was completely removed. Yeah! That would be CONCEALER! Oh, what a day already! Haha!!! This had me rolling! Too funny!